I only bought this for curiosity value but have used it on occasion in a table lamp. Does the phosphor coating looks white when unlit? Except gold, the phosphor should have a white body color. 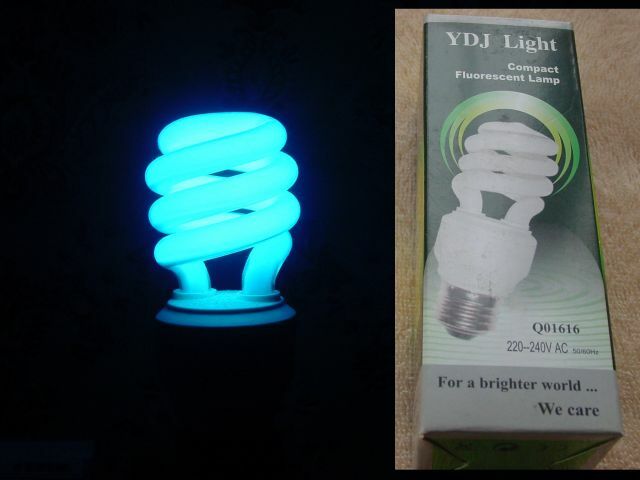 Many colored CFLs have also an external glass coloring, like colored incandescent lamps, to prevent their color to become pastels (This is most prominent with rare-earth phosphors, where without external glass coloring, red looks pink and green looks pastel green, because of the mercury lines or the extra lines of the phosphors). Robert: yes, the phosphor coating is white when unlit. @dor123: I did have one that was supposed to be red but was actually pink when lit. White when unlit. It failed after not a lot of use. I also have an externally coloured yellow/gold one which was marketed as "does not attract flying insects".